﻿ University campus voted third best green space in the UK! Reading home> News and Events > Press Releases > University campus voted third best green space in the UK! University campus voted third best green space in the UK! The University of Reading's stunning Whiteknights campus has once again been voted one of the best green spaces in the country following a nationwide public poll. The University has been ranked number three out of nearly 1,500 public spaces eligible to be voted in the People's Choice Award as part of the Green Flag scheme, which is one place higher than last year. The Whiteknights campus was also the most highly rated university space. All Green Flag Award-winning parks and green spaces were entered into the annual poll with the public asked to vote for their favourite. Reading received its second Green Flag Award earlier this year in recognition of its well-maintained and well-managed campus. Judges were impressed by the 134-hectare site which contains wooded areas, open meadows, a lake, shrubs and borders and county standard sports pitches. A network of paths links these different and exciting areas, making it an accessible and enjoyable place for all to enjoy. They also paid special tribute to the University grounds team's 'dedication' and their 'willingness to go the extra mile'. 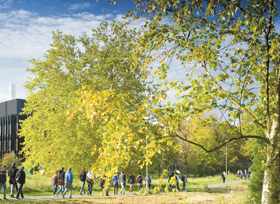 University of Reading Vice-Chancellor Sir David Bell said: "We are delighted that our Whiteknights campus was voted one of the best green spaces in the country. We take great pride in the campus which is one of the most beautiful university settings in the UK. This award is testament to the commitment of the University's grounds and facilities maintenance team. Without their hard work, our campus would not be such a wonderful place to work, study and visit." The Green Flag Award scheme is the benchmark national standard for parks and green spaces in the UK. Grounds management, innovation and the way facilities are tailored to the needs of the community are taken into account. The University of Reading is ranked among the top 1% of universities in the world (THE World University Rankings 2012) and is one of the UK's top research-intensive universities. The University is ranked in the top 20 for the number of awards it received from research councils for 2010/11.